The Oconee County Board of Commissioners took no action Tuesday night after a presentation by and question-and-answer session with Terry Tevis, who has recommended the county build a $2.9 million replacement for its existing Animal Shelter. 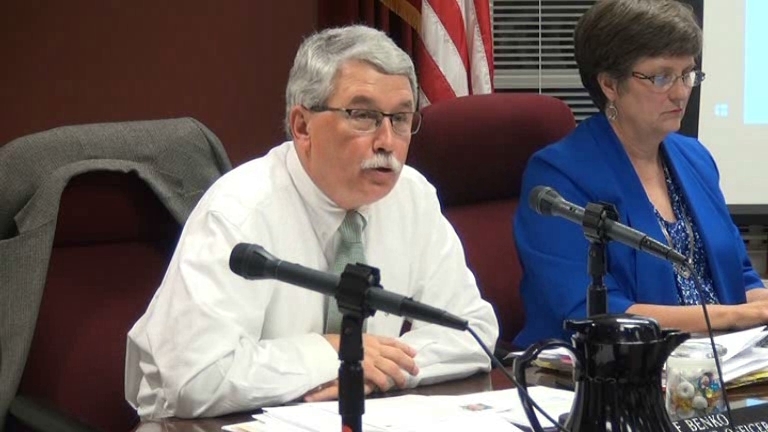 Tevis submitted an update just before the meeting to the report he gave the county on Jan. 9. The Jan. 9 report was the result of a feasibility study his firm, Tevis Architects, did of the county’s existing facility on Branch Road in the far south of the county. Commissioners questioned Tevis about his recommendation that the county replace the existing facility rather than remodel it, about what they called inconsistencies in the report, and about expense estimates for components of the facility. Consistent with a policy articulated at the Commission meeting on Feb. 7, Chairman John Daniell did not allow for public comment on the feasibility study, since no action was taken. Before the discussion began, however, Daniell said the public will have ample opportunity to comment before the Board makes any decision on what to do about the Animal Shelter. He did not give any timetable for future discussion or action by the Board during those comments, and none was offered following the discussion of the Tevis report. The Commission held a public hearing early in the meeting on an appeal by Lovett-Keller Ventures LLC of a decision by Oconee County Utility Department Director Wayne Haynie to turn down a request by Lovett-Keller for a transfer of sewer capacity for a subdivision in Bogart. Attorney T. Wesley Robinson of Gainesville, representing Lovett-Keller, and Haynie presented different versions of the exchanges that led Haynie to turn down the request that the developers be allowed to purchase sewer capacity from the dormant Westland subdivision on U.S. 78 near the Apalachee River. Lovett-Keller wants to convert 28 acres that had been zoned for commercial development into a residential subdivision and to have access to the county sewer system for that purpose. At the end of the hearing, Daniell said the Board will decide on the appeal and inform the parties within 30 days. County Administrative Officer Benko presented to the Board at the meeting on Tuesday a proposal for minor changes in the county’s organization structure ordinance. The biggest change would be in Benko’s title, which would become County Administrator. In the section of the ordinance dealing with the job description of the BOC Chair, the new ordinance would stipulate that the Chair would develop “policies and positions related to the future needs of the county and its governance,” as it now states. The Board had discussed these changes at a work session in Jan. 6, and the item was put on the agenda for action at the meeting on March 7. One side of the Commission chamber Tuesday was nearly filled by persons wearing t-shirts labeling themselves as volunteers at the Animal Shelter. At the Feb. 8 meeting of the Animal Control Advisory Board, Catlyn Vickers, director of the Animal Control Department, had encouraged citizens to turn out at the Board of Commissioners meeting to be able to “voice their opinion” about the feasibility study. Oconee County Administrative Officer Benko also was present at the Feb. 8 meeting when Vickers extended her invitation to the citizens present. The agenda for Tuesday’s meeting was released on Friday morning, listing the feasibility study as as on the agenda for discussion without indicating that any action would be taken. Daniell said in his comments on Feb. 7 that only items on which action is taken will be open for public comment. Tevis apologized at the front of his 46-minute presentation and discussion with the Board for not having a proper PowerPoint ready for use. Instead, he scrolled through a projection of his revised report. Daniell said there were inconsistencies in the report in its description of the capacity of the existing shelter. Tevis said that resulted from the way the facility is utilized at present and he would recheck the figures. Tevis also said, in response to a question from Daniell, that one of the graphs in the report was “erroneous” and that he would replace it with the right one. Commissioner Mark Saxon challenged the cost estimates Tevis gave for specific rooms if the county decided to remodel the existing facility rather than build a new one. Tevis said he had done those quickly in response to a request from Benko and had made his best estimates. He said he would revisit the estimates. The county has not yet released the latest report, though I asked for a copy this morning. County Clerk Kathy Hayes treated the ask as an open records request and acknowledged its receipt. During the citizen comment section of the meeting, Russ Page, long-time advocate of transfer of development rights, once again asked the Board to consider a recommendation of a citizen study committee that the county move forward on consideration of a transfer of development rights program. Cindy Mitchell McGarvey, of Friends of Calls Creek, asked for guidance from the Board on what she as a realtor should tell potential home purchasers of the county’s plans for sewer lines down the county’s creeks. Daniell told her that lots of different plans are one the table and that is all that is known. I proposed to Commission Chair Daniell that he label items on the agenda each week that would not be open for public comment so there would be no confusion on the part of citizens. The agenda for the meeting on Tuesday that was released on Friday contained 13 items. A 14th item was added to the agenda at the meeting on Monday. Included on the list of 14 items was approval of the agenda, statements from citizens, statements from commissioners, a public hearing on Harden Hill Road abandonment and its transfer to the city of Watkinsville, the Lovett-Keller hearing, an executive session if needed (one was), and adjournment. All of the remaining seven items were marked as “Discuss.” None of those was marked as an item on which action would be taken. The Board took action on two of those seven items labeled “Discuss,” though they were not marked as action items on the agenda. These were for bids for fire equipment (added on Tuesday) and a memo of understanding with St. Mary’s Hospital for emergency medical services. In those two cases, Daniell accepted citizen comment, though no one took him up on the offer. Included in the items labeled “Discuss” but not opened up for citizen comment was the Animal Shelter feasibility study, which took up the largest amount of time at the meeting and which drew the largest crowd. Daniell did not say it, but only two of those meetings, other than the town hall meeting, were ones during which citizen comment was accepted. “There will be additional town hall meetings, and to suggest that this Commission is not interested in your input is totally false,” Daniell said. The video of the meeting is below. Administrative Officer Benko introduced Terry Tevis and gave background on the study, starting at 35:57 in the video. Tevis’ presentation begins a 37:29. Citizen comments begin at 0:50 with Daniell’s introduction. OCO: BOC 2 28 17 complete from Lee Becker on Vimeo. fashion to manipulate public input is in poor taste. Headlines and content reading more and more like mainstream media tHan reporting of facts. May need to have editorial section to each ppst. You are quite correct. I think citizens should have the opportunity to comment on all items on the agenda as well as on items not on the agenda. At present, citizens can comment on items not on the agenda but only on items on the agenda on which the Board takes action. Those items are not identified in advance. I stated my view at the meeting. I think government should do everything it can to encourage citizen participation, not limit it. This has been a motivation for this blog from its beginning in 2006. It is because of a desire to stimulate citizen participation that I often write about the agenda of meetings before they take place as well as after. The headline on this post contains three pieces of information. The Board discussed the issue. It did not act (obvious by inference). It has not indicated when it will act. Citizens approved an upgrade to the Animal Shelter with the 2015 Special Purpose Local Option Sales Tax. The county paid for and received a feasibility study of the current facility and an upgrade. That study and recommendation is before the Commission. Whether people favor or oppose the recommendation of that study, I expect they will want to know what action the Board has taken and what it plans to do in the future. You correctly state that John Daniell is following the rules he laid out for comment. I wrote exactly that in the fourth paragraph of the post. Nothing I wrote suggests the policy is “arbitrary.” It is designed to limit public input at Commission meetings where no action is to be taken, as Daniell has stated clearly and as I reported. In the post, after discussing the sewer issue and the organizational ordinance, I indicate that citizens turned out because the Animal Shelter was on the agenda and explain why they turned out even though the item was labeled as for discussion. I next discuss the report itself, pointing out criticism of it by the Commission and problems admitted by the author. I then discuss the citizen comments made, including mine and one by another citizen about the policy Daniell has developed for citizen comment. I then explain what that policy meant in terms of Tuesday’s meeting. I then explained Daniell’s response. Readers should be able to decide for themselves how they feel about the issue. I am a member of this community. I have a dog that I adopted from the Oconee County Animal Shelter. I shop at local stores. I am on the Board of the Oconee Farmers Market. I organize candidate forums and helped create a Citizen Committee for Water Resources. I drive the roads, live in a subdivision of Daniells Bridge Road, pay taxes, and participate in the community life. All of these things, plus my strong views about citizen involvement, government openness, and transparency, influence what I write. I have tried to be clear about those biases. I also understand that there are competing views on all of these things and have tried to reflect those views in the posts, in the video used, and in the comments. As always, I am 100% in agreement with you, Mr. Becker. Keep up the good work, and THANKS. Yes, I so much appreciate your doing this blog and helping us stay informed. I was at the meeting and you have reported on it accurately. I understand why the commission would want to limit input at certain stages of discussion of an item. The Animal Shelter is a case in point as they have only had the report for a short time. The problem, as you pointed out, is that the items on the agenda are not clear as to whether citizen comments are allowed or not. They should make that clear. Even the department head and Mr. Benko were not clear on that. I am sure the citizens that came were disappointed (I did not come for that reason, just attending out of general interest) and felt let down by their Commission, an outcome that did not have to happen. This is too bad as I think this Commission is trying to be more open. There should be time at every public meeting for citizens to ask questions or vent their complaints about anything that is on their minds that affect our county. It should not matter if it is on the agenda or not. There could be time limits for each comment and for the total comment time in order not to run the meetings too long. Did anyone read the 10k report? The lack of attention to the numbers and a pitiful presentation. No regard to funding. In who's world are finances ignored? No reason no action was taken. Is the report online (County website) for view by the citizens of Oconee County? The county had the report online before the meeting on Tuesday but removed it from the agenda page in preparation for the meeting this coming Tuesday. I was able to find it via a search of the site, but it helped to know the document title to be able to find it. I received it via an open records request shortly after it was submitted to the county and used it for the stories I have written on the study.